We were seeing The Cripple of Inishmaan at the Antaeus Theatre in Glendale, and if an Irish play isn’t a good excuse to try a Georgian restaurant in an Armenian neihborhood, what is? I’ve never been to the capital of Georgia, but I imagine Khinkali House is decorated to look like the best four-star hotel dining room in mid-1990’s Tbilisi. There are dozens of chandeliers, a shiny mirrored bar and a lone violinist whose repertoire leans to the mournful (dumplings and the theme from Schindler’s List, anyone?). The host allowed us to pick a table, so we settled in to a large round one in the back. The server explained the menu and encouraged us to try her favorites. We were not in their restaurant, we were in their country, and we felt very, very welcome. The woman at the next table must have overheard our struggles pronouncing the names of dishes. She asked us if we’d ever eaten Georgian food before. I had, one dish: In my mid- twenties I developed a fascination with the national Georgian dish, khachapuri, after coming across a recipe in Bernard Clayton’s The Complete Book of Bread. To this day I don’t understand why a cheese-stuffed flatbread topped with an egg has never become America’s next big brunch thing. The rest of Georgian food was a mystery to me, I told her, except I had once read that Georgia produced some of the world’s oldest wines, maybe the world’s first wines. “You have to try Kindzmarauli,” she said. The server, a young woman from Russia, agreed. “I’ll bring you a sample,” she said. We toasted with it. Wow. Kindzmarauli is a semi-sweet red wine with a deep plum jam flavor. I table-Googled and discovered it was Josef Stalin’s favorite wine. Bad man, good taste. The woman, Mariana, was visiting with her two daughters from Las Vegas, where she has lived for years. But originally she’s from Georgia. “Even my car has the license plate, ‘Tblisi,’” she said. I told her not only were we seated beside each other, we parked beside each other too. In LA, that’s practically a relationship. I trusted Mariana. She not only knew her country’s food, but I could tell she knew how to make it. She had to: Khinkali House was the best Georgian restaurant around, she said, and it was five hours from her home. The food at Khinkali House reflects the clientele: Armenian, Georgian and Russian. For appetizers we ordered ish, an Armenian bulgar and tomato paste salad, along with some stuffed grape leaves, and the khachapuri. Their version arrives on a skewer. 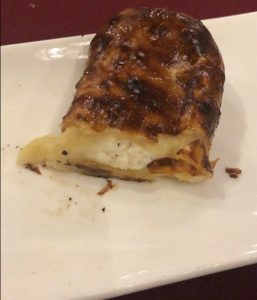 It’s a cylinder of crisp pastry that surrounds a slightly tart, melted white cheese. It’s like a cheesy egg roll, not at all the traditional shape for what is usually a flatbread. Mariana did not approve— but I would have ordered and eaten more. There are many types of grilled skewered meats at Khinkali, including chicken heart and sturgeon, as well as classic Georgian dishes like chicken in a yogurt-walnut sauce. But we had saved our room for the khinkali. 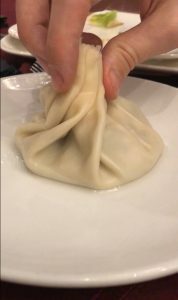 Khinkali are Georgian soup dumplings. They are usually stuffed with beef or cheese, though at Khinkali House there’s a very good, vegan mushroom version. The standard order at Khinkali House seems to be a dozen of these dumplings, set atop a metal platter on a high stand, and shared among the table. Mariana suggested we order the beef dumplings boiled, as is traditional, and the cheese or mushroom dumplings however we wanted, either fried or boiled. They arrived, and I turned to Mariana for instructions. She told me to pick it up by the bunched-up knot of dough, what Georgians call the tail. Then as per Mariana, I pierced the hanging sack with my teeth, and let the juices and filling run into my mouth. Outside Khinkali House, it was cold, and the ground was puddled with rain. Inside, we were sharing some wine and conversation with Mariana and sucking down warm soup dumplings. In a few minutes, we’d be in a darkened theatre, visiting the Aran Isles in 1930’s Ireland. I’d happily return to either.